I needed a quick spinach dip for a party, and since I knew many of the ladies were watching their weight, I didn't want to use my beloved full fat mayonnaise. 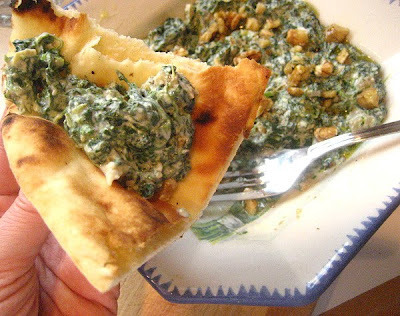 Instead, I made a nice Greek style dip with lemon and dill and fresh spinach that was blanched and sauteed. I used a nonfat Greek style plain yogurt and it turned out great! No one could tell that I took out the fat! (then everyone could eat dessert without feeling guilty!). I got the idea of using chopped walnuts for the top from a Persian recipe called Borani Esfanaaj, which is similar to this dip except there is no cheese added. I like to use fresh spinach, but of course you can use a package of frozen chopped spinach. If you are using frozen, make sure after defrosting you squeeze out all the excess water. 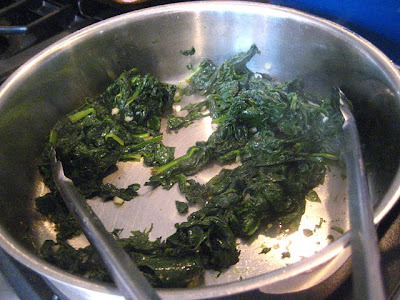 Steam your spinach and cook it with the remaining minced garlic clove in a little olive oil till fragrant. Set aside. When the spinach has cooled, add the rest of the ingredients along with the other raw garlic clove and mix together with the yogurt. Lay out in a flat round dish and sprinkle with walnut pieces. Drizzle with a little olive oil just before serving. Serve with warm naan bread or pita bread. God, do I understand those abstemious ladies! My pants fit just fine, but my spirit, my soul, is STILL overwhelmed by the endless groaning tables I encountered this combo Passover/Easter weekend. Don't want to eat for a week. Which I HATE! Funny, being swamped with TOO much food had temporaily robbed me of desire for one of my main pleasures, FOOD! I just need a break. Back in the saddle real soon, I'm sure. That looks so much better than that old version everyone has been making for years. Much healthier, no guilt, and I love my Greek yogurt anyway, of course the pita or naan I would have to have self control with, love that stuff! That looks like a great dip. Going to have to send this one to my mom as she has such a hard time cooking for her friends as they are all always watching their weight! I'm always watching my weight, and it's still stuck to me. Seriously, it's nice to mix up the go-for-it fat gram recipes by balancing it with healthier versions. Greek yogurt is a great healthy alternative, in disguise. Love anything Greek, because I love spinach and feta. Mmmm. This looks like a very tasty dip. Thanks for sharing your recipe. I love this healthy and flavorful dip - adding the walnuts gives it great texture. Spinach dip is a serious weakness of mine. I love how I could eat this without all of the guilt! I love all of the Greek flavors in this healthy spinach dip. What a great idea to add the walnuts. Perfect! My God, you're such a good girl. I guess I need to eat more like this to lose the weight I put on over the weekend. Looks delicious. Yum, I love stuff like that! I would rather eat dip than dessert any day. I love this dip! So healthy AND so delicious! I just shared your recipe and linked back to your site on my blog today...I hope that is ok! Your recipes are so good!